View More In Hair Building Fibers. Anti-Clump Formula - Doesn't clump up or absorb moister and get fat. Clean Pillow Formula - Hardly comes off when used with standard hair sprays like Fineness. Easy To Apply - Applicator bottle makes it very easy to apply. Try the rest? This is the best! Highest Quality On The Market! 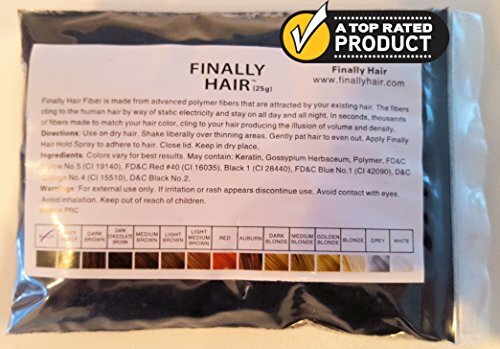 If you have any questions about this product by Finally Hair, contact us by completing and submitting the form below. If you are looking for a specif part number, please include it with your message. Piz-zaz All-Natural Keratin Hair Fiber Set: 2 Bottles of Fiber (28g) + Holding Spray (4fl.oz.) "Black"